Enjoying audio contents has become an integral part of the whole smartphone experience and with the arrival of apps and services like Spotify, Pandora Internet Radio and Podcast apps, more and more people are starting to listen to their favorite audio contents. Interestingly, mobile phone manufacturers are little behind on the trend and very few models come with built-in equalizer to adjust the sound quality and attributes based on the individual’s choice. Also, these built-in equalizers are not very user friendly. That’s where 3rd party equalizer apps excel; there are lots of audio equalizer apps available for Android devices yet Equalizer FX Pro is one of the most popular of them. Equalizer FX Pro is available for all Android devices running Android 4.0 and above. The app is compatible with Android phones as well as tablets and both form factors have specially designed versions. It has been downloaded more than 100,000 times and current rating of 4.2 is pretty impressive. Equalizer FX Pro comes with some standard features like equalizer to change the volume of different frequency sound bass booster to amplify the low frequency sound and give it s booming effect, virtualization to improve the stereo effect and many built-in presets. The app comes with some advance features which are only available in Android devices running Android 4.4 or above. 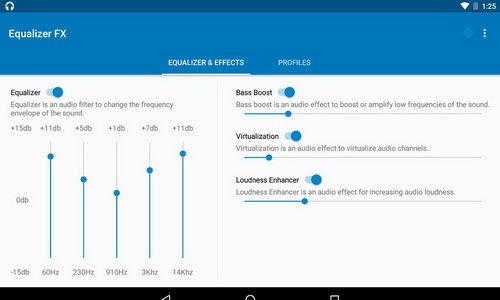 For example the loudness enhancing feature is not available in pre Android 4.4 devices. This feature increases the sound level without distorting the sound. The developing team behind Equalizer FX Pro has done its best to make it compatible with popular music players, podcast apps and music streaming apps. You can use it perfectly with apps like Pandora Internet Radio, Spotify, Tune In Radio and others. The latest version of Equalizer FX Pro comes with a widget too so you can access the app and its features with a single tap directly from your home screen. Because of its integration with other apps, Equalizer FX Pro starts working automatically when you play music and stops working when you stop the music. Equalizer FX Pro is available for $2 that seems like a fair deal considering its amazing features and how much you can enhance your device’s sound with a small investment. Equalizer FX Pro is not the only popular equalizer app in Google Play Store. Equalizer Music Player Booster is another amazing app that is actually a “suite” with three main features; a music player, an equalizer and a bass booster. Unfortunately, Equalizer Music Player Booster is not compatible with other apps like Spotify or Pandora Internet Radio so you can only use it with music saved on your device.